From deserts to rainforests, coral reefs to mountains, the empty Outback to the busy cities, Australia, the world’s largest island, is a land of fascinating contrasts. Facts about Australia contain many superlatives: there are an estimated 27,700 plant species, including living fossils such as the cycad palm, and brilliant wildflowers, such as the waratah, Sturt’s desert pea and kangaroo paws; and more than 80 per cent of the 378 mammal species, 828 bird species, 4,000 fish species, 442 species of lizard, snake and crocodile, and 50 types of marine mammal are unique to Australia. Perfect for nature-lovers, the country also offers fantastic opportunities for sporting enthusiasts from diving to surfing, hiking to climbing. The great outdoors is a perfect description of this vibrant country. For relaxation, apart from the glorious beaches, there is also a wealth of wine, food and culture to be sampled. Australia has more than 60 designated wine regions and has developed a worldwide reputation for its award-winning wines. Among its many home-grown products, there are local cheeses and olive oils direct from the producers and there’s a range of dining options from world-class restaurants to Outback barbecues. 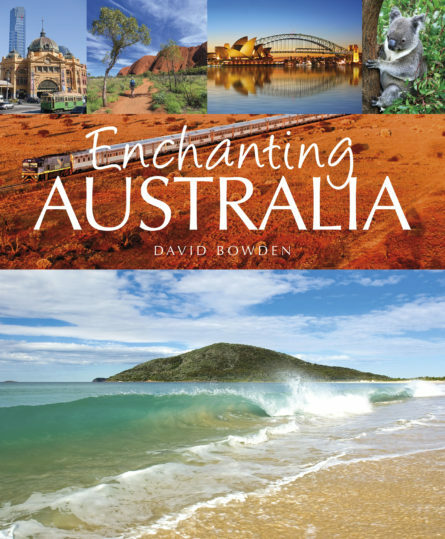 Enchanting Australia describes and illustrates the spectacular natural world, the bustling cities and the adventurous pursuits just waiting to be explored. David Bowden is a freelance journalist, specializing in travel and the environment. Born in Newcastle, he went to university there before moving to Sydney, where he worked for 15 years. He now lives in Malaysia but returns home frequently. When not travelling the world, he enjoys relaxing with his equally adventurous wife Maria and daughter Zoe.